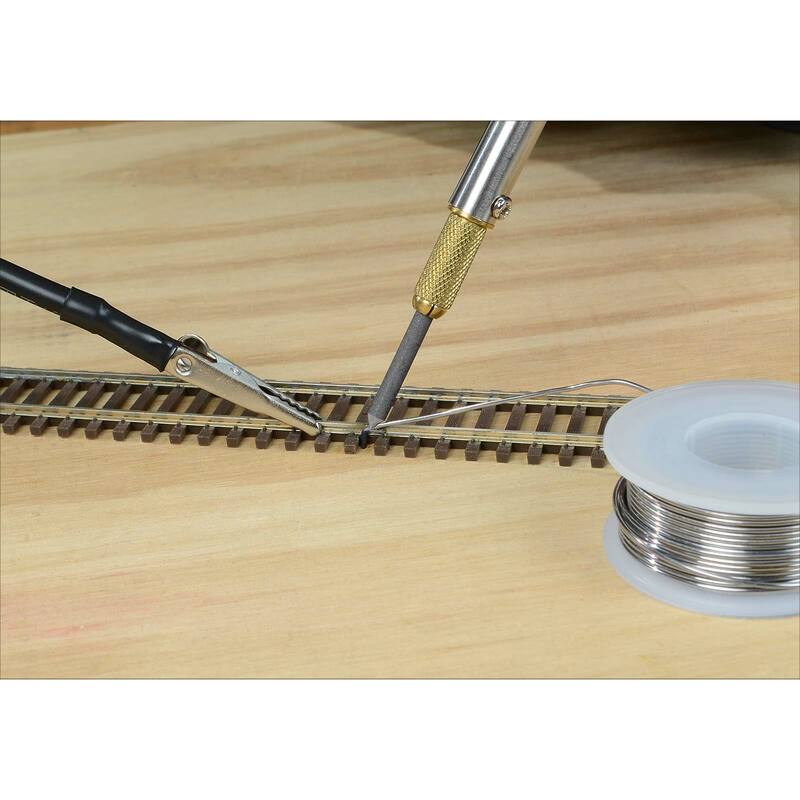 Solders feeder wires to model railroad track without melting plastic ties! Be sure to watch the video . . . Easy-to-use resistance soldering unit generates heat only at the joint, so that already-soldered parts won't fall off while adding new ones. How it works: With the ground clip connected, place the carbon electrode on the tip of the handpiece in contact with the part to be soldered and step on the foot switch. The transformer passes a safe, low-voltage electrical current through the part, which heats it to soldering temperature within seconds. Apply the solder, then release the foot switch to instantly cool for a strong, durable joint. Includes 63 watt* transformer with dual power outputs for heavy- and light-weight parts (plugs into standard 110/120V household outlet), handpiece, 6 carbon electrodes, ground lead, on-off foot switch, and instructions. *Since a resistance soldering unit concentrates heat at the joint, it will heat larger work than will a conventional soldering iron of the same power. Several weeks ago I ordered a resistance soldering unit from Micro-Mark. I am a train enthusiast with a N scale layout. I am in the process of upgrading to DCC from analog and needed to replace the tracks with new tracks with feed wires every 12 inches. 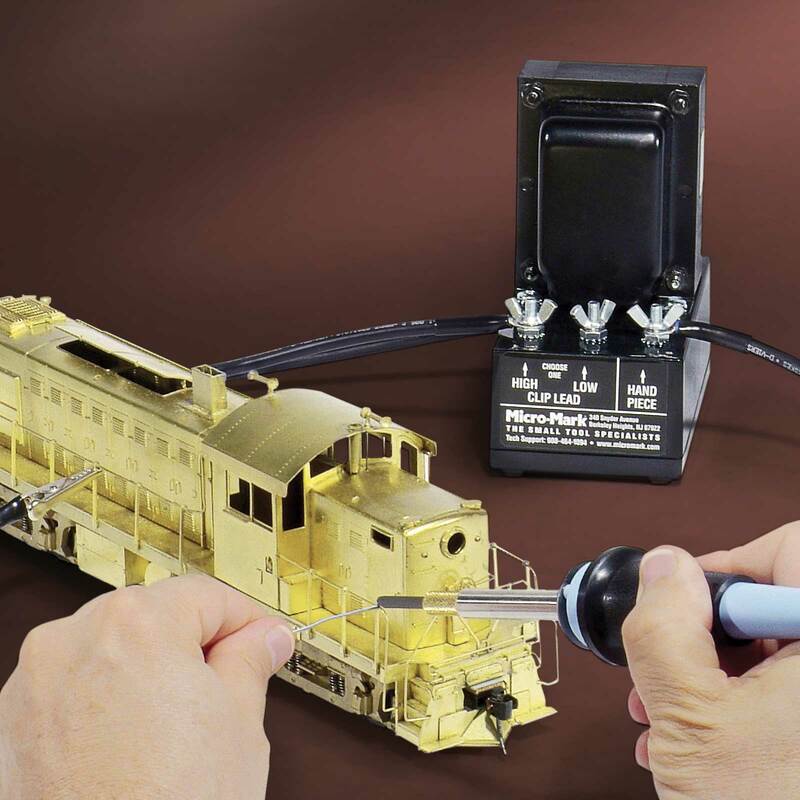 I have seen some N scale clubs who solder these feed wires on the outside edge of their tracks, and it looks terrible. I decided to take a gamble and buy from you item #85522 - the MicroLux Resistance Soldering Unit. It took me several hours to figure out how to use it effectively; however the finished results are stunning. By the end, I had wires carefully soldered to the bottom of my track every 12 inches (where they will be hidden by the track ballast). Once I had the process figured out, none of the plastic ties show any melting from the heat. Those who have seen what I have done are amazed.